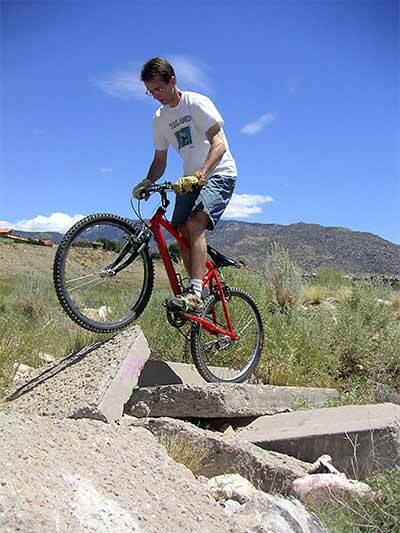 You have probably watched the pros do all the really cool stuff on a bike and thought, 'That's really cool but I could never do that." This page will be dedicated to helping you get started and eventually will explain the techniques for trials. For now, here are some shots of some local sections. 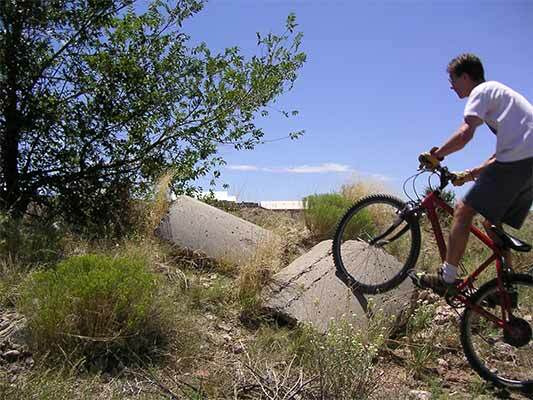 Trials sections are incorporated into the trails of the Daisy Maze. You'll have to explore the maze a little to find them unlit the map is completed. Daisy Maze is located in SE Albuquerque. Send an email or call for directions to the maze. IMPORTANT - PLEASE READ THIS! To maintain the integrity of the maze, we ask that you strictly follow the following quidelines. 2. 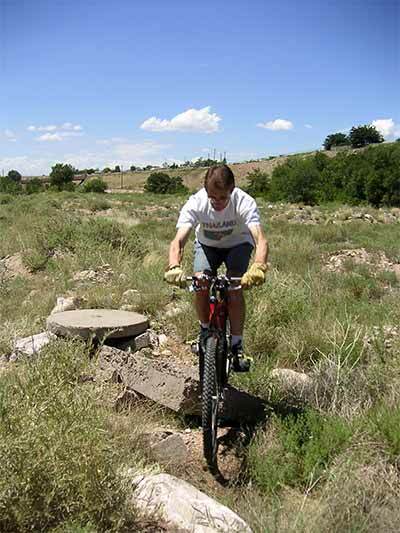 Treat the trails like railroad tracks. i.e. don't turn on the 90s or crossings. Don't go the wrong way on a fork. 3. If you make a track outside of the trail, please go back and clean it up. 4. Some of the sections may be way beyond your ability. 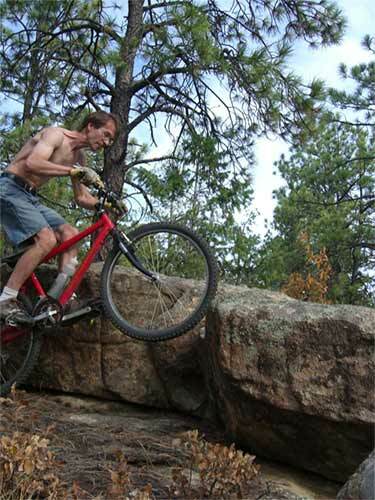 If you need to you may CARRY you bike to another trail. There are many trials sections. If you find a section to difficult, work up to it with easier sections. Don't modify sections that were intended to be difficult. 5. Please do not publish the directions to the maze on the web. If you don't know how to get there, contact me for directions. 6. If you bring someone new to the maze, please explain these guidelines to them. 7. Ride at your own risk. You are responsible for yourself. 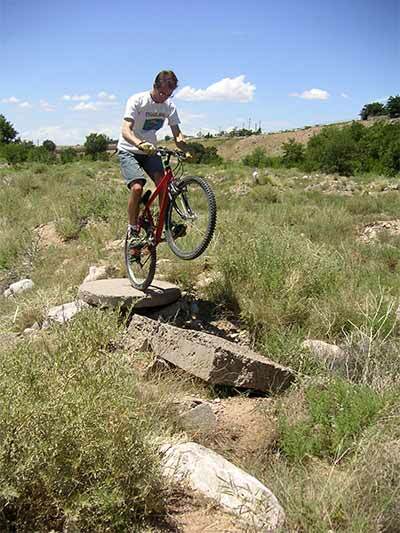 *Exception for trials sections - Most of the trials sections are on rocks. Ways to define and constrain them are being considerd. Red and blue ribbons would be used except that most of the sections can be run in either direction. For now, try to stay on the rocks. turntable, but your wheels cannot touch outside this concrete disk. Novice trials riders will find it a challenge just to ride straight across and will not be able to make the turns. 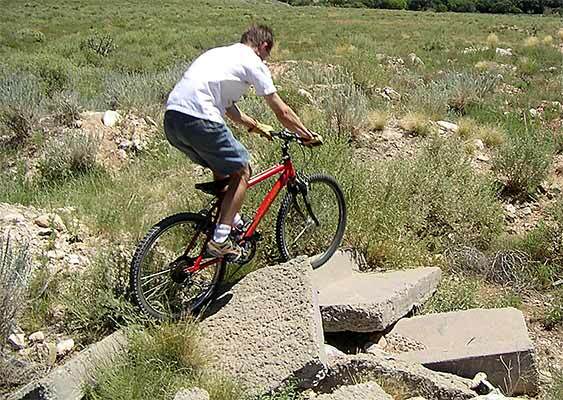 Be sure to pull up and keep your weight back as you ride off the disk to avoid a face plant. There is a drop off on the north side. 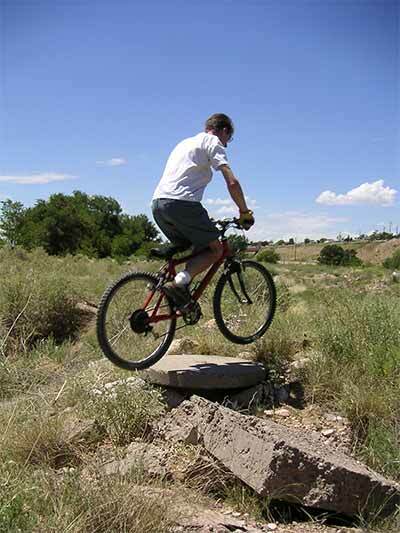 Intermediate riders may be able to make the turn s with lots of practice. 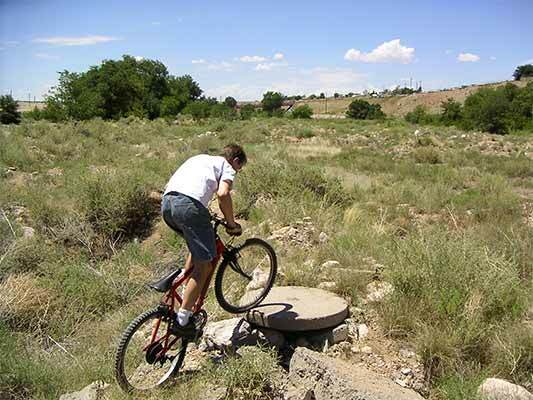 Pull the bike into a wheelie as you come onto the disk. 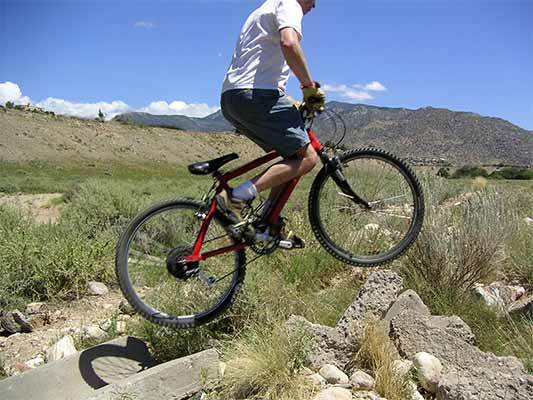 Rotate while on the rear wheel. Launch to the next slab of concrete. 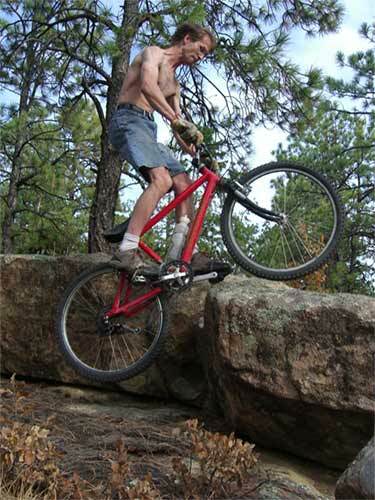 Maintain the wheelie and hop onto the next rock. Another approach is to set it down and roll onto the next rock. The toast section is on the north end of Pogdatch. It is one entrance to "Major Ripples" trail. "Slices of Butter" at the other end of "Major Ripples"
because the approach is very short. 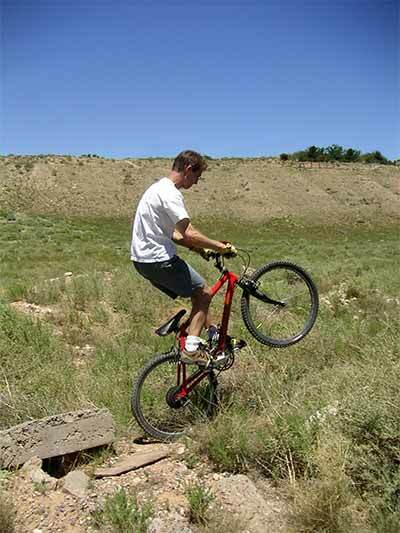 Start by pulling into a wheelie. 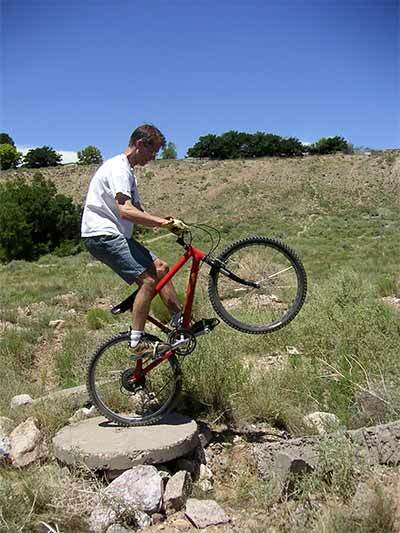 Get the front wheel onto the obstical. 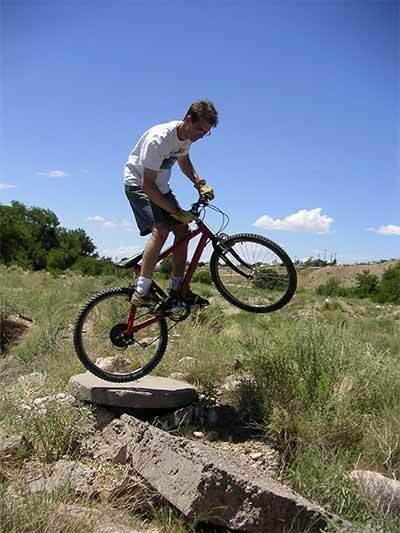 Fully extend to the standing position lifting the bike with you as you launch up on the obstacle. Follow through bringing the rear wheel up. When you are first learning you will not be able to jump this high. 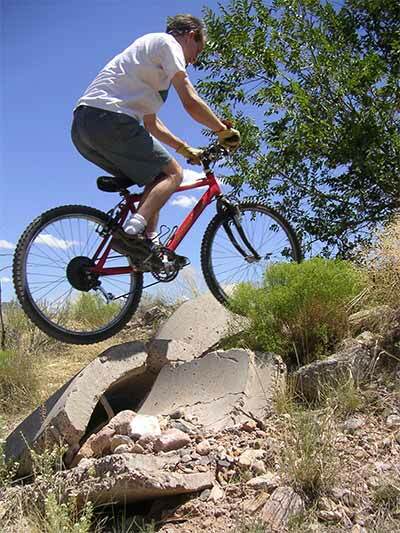 Start with something like a curb and work your way up. 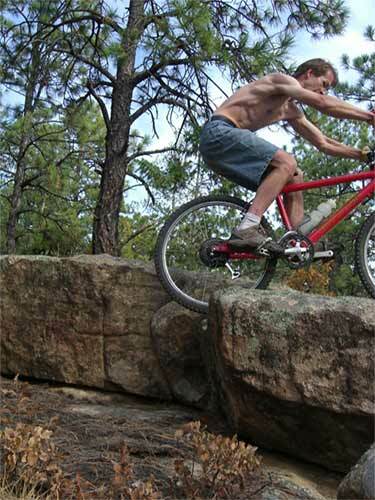 We also ride trials at the Maze, if you would like to join us.